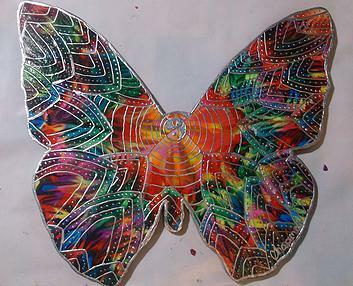 Patty Chapman is one of the talented artists that have been gracious enough to create butterflies for our Drops. The above quote describes her journey of rediscovery and rebirth perfectly. In 2009 Patty’s husband Scott, the love of her life, was diagnosed with terminal cancer. As his health deteriorated she was consumed with thoughts about his death. Day after day sitting with her dying husband filled her with unimaginable grief that was leading to despair and hopelessness. In an attempt to distract her from the reality she was drowning in, she began to research interesting topics online. One topic that Patty was especially interested in was art as it related to children and child prodigies. She recalled her own childhood as being one filled with magic and artistic exploration, something she had felt slip away as the world had begun to place it’s restraints around her heart. As an adult Patty felt as though the childhood of her memory that was full of color and wonder had become a rigid black and white universe. Not only did the art she create reflect this, but the specifics of her personal story had become bleak. 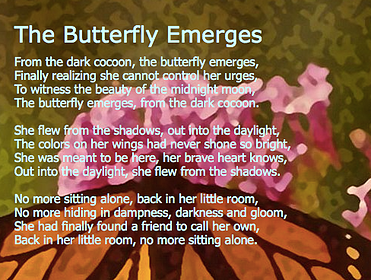 Patty felt as if the world and life’s circumstances had encased her in a cocoon. Forest, an artistic genius that had been critically acclaimed at the age of 8. “I jumped into the rabbit hole”, Patty says, after being inspired by the amazing works of art that could be created with a simple crayon. This rabbit hole lead Patty to be completely absorbed into a method known as Encaustic painting, where an artist uses a variety of tools to work with melted wax, creating beautiful masterpieces. After making a small investment in supplies, Patty began experimenting with methods. One day, as Scott’s health continued to deteriorate, Patty emerged from a session at her kitchen table and realized that three hours had passed. Three hours of Peace. Three hours where worry had subsided. Three hours that she was not contemplating, Scott’s death, being alone and planning a funeral. Patty was elated and relieved to have found a coping method that didn’t remove her from Scott’s side, something that freed her from the pain of the reality she was facing, and a healthy distraction from the turmoil that she was wading through. Scott’s battle with cancer ended in June, 2011. After meeting online through a shared love of art and creativity, Patty agreed to paint 3 butterflies for Butterfly Effect. They are some of the most beautiful creations to date. It is an honor to collaborate with such a gifted artist and truly lovely human being. We are proud to share her story with you. For more information, tutorials and photos of her work click here. Thank you, Patty for your inspiration and Being the Change!